Experience the thrill of owning a state-of-the-art home theater — at an affordable price. Never before has the concept of a home theater been so real and achievable. The products that make up a home theater are experiencing price wars which have dramatically reduced the overall cost of our custom home theater packages, greatly benefitting our most valued customers. We have designed a variety of different theater packages for almost every budget, so every entertainment enthusiast can experience the thrill of a cutting-edge theater system. Home Theaters add tremendous entertainment value and create the “wow” factor that sticks with everyone who enters your home. 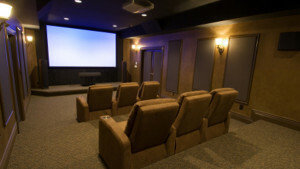 Our top-of-the-line theater packages are designed for consumers seeking the ultimate dedicated home theater experience. Our engineers design, install, and program each theater system making them capable of delivering a truly high quality viewing experience like no other.